A tapestry showing the meeting of a horse with a dog. Based on the original by George Stubbs, this tapestry Bay Horse and White Dog represents sheer delight in the composition of the horse and the dog as well as the attention to the beauty of the environment with the trees, clouds and bushland and earth. 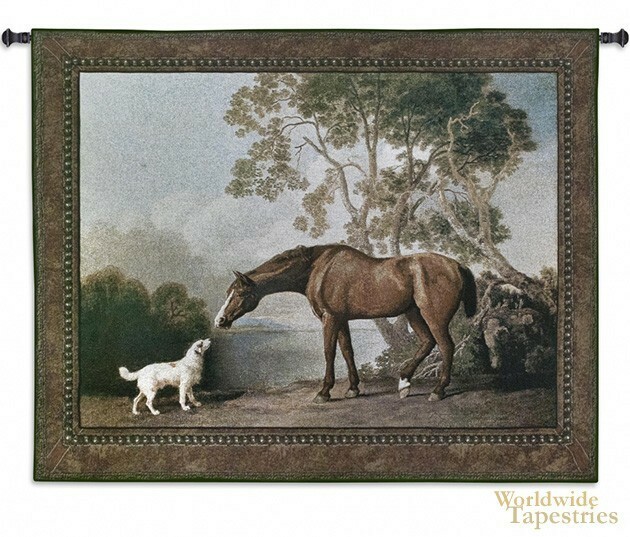 Stubbs' work has specialised in horses and dogs and their activities such as racing, and this tapestry captures both of his loves where these two creatures meet. A very pretty study of both animals as well as the surrounding natural bushland. This tapestry is backed with a lining and tunnel for easy hanging. Note: tapestry rod and tassels, where pictured, are not included in the price.